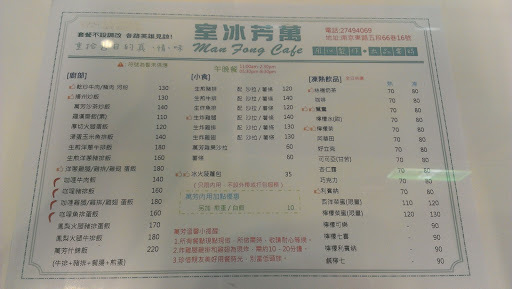 The WanFang Hong Kong style restaurant is based in the 松山區 SongShan District of Taipei City. 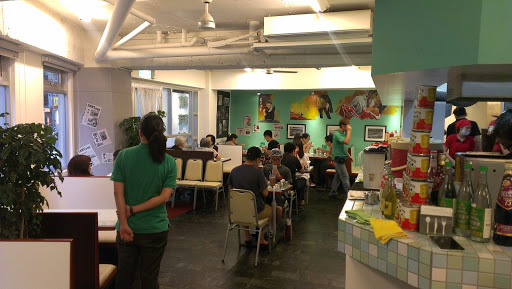 There a multitude of 香港茶餐廳 Hong Kong Tea restaraunts in Taipei, all specializing in the small plates that Hong Kong has become famous for. Plates such as ShaoMai, Pineapple bread, fried noodles, fried rice with sausage and various other dumpling dishes. On in the inside, the restaurant is fairly plane, with nothing particularly setting it aside from other restaurants. 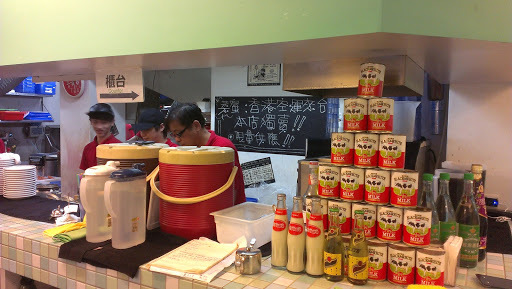 A lot of restaurants like to showcase the infamous tins of Hong Kong milk that they use in their tea or coffee. 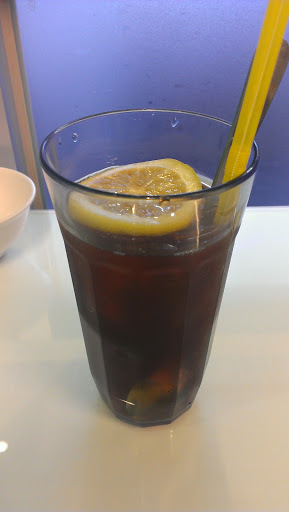 Hong Kong, in fact, is a very popular tea drinking destination and mainly for the milky black/red tea. The restaurant is bright and there is ample seating, with another little seating part around the corner where we sat. There are also several booths each seating around 4 people. 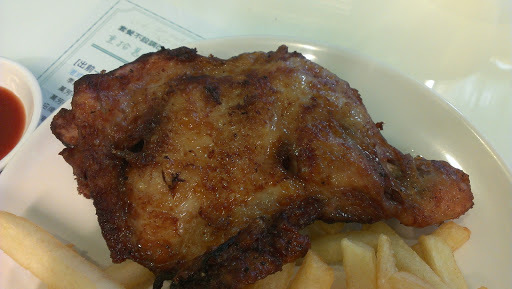 The fried chicken leg here was one of the main draws for coming here. Fried to give it a wonderfully crispy skin, but still maintaining great tenderness of meat inside. The skin is seasoned really nice with a light spice and a good saltiness. Chicken skin isn’t hugely healthy, so I wouldn’t suggest eating more than one of these at any given time. However, it’s too good to not eat! 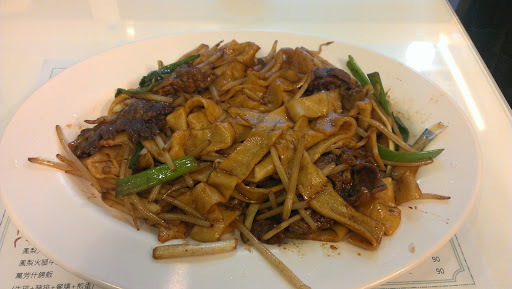 Slices of thin beef, flat noodles, green onions and bean sprouts round off this triumph in fried noodle dishes. The sauce was a little salty, but the sweetness of the bean sprouts balanced it out rightly. The green onions also added freshness to the dish. The beef was well seasoned and, like the chicken, was crunchy on the outside and also tender on the inside. 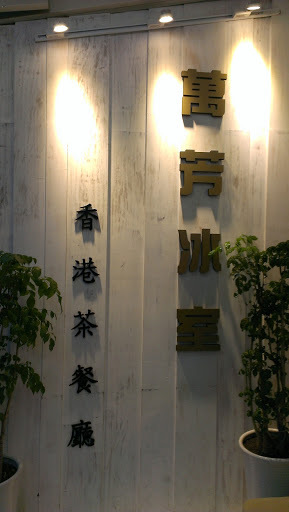 The pineapple bun is as I have said before here: YanJi Hong Kong tea restaurant , fantastic and really a must-order at any Hong Kong tea restaurant such as this. The outside of the bun is crunchy and the inside is fluffy and soft. 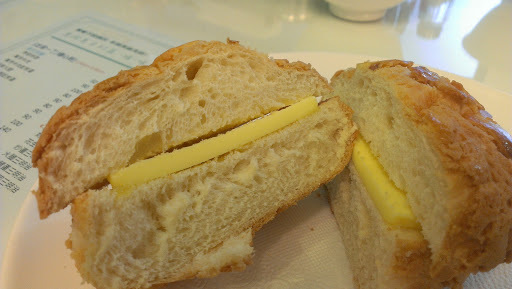 The slice of butter wedged in between the two halves is rich and delicious. However, my main gripe about this is that this pineapple bun is not warmed. Warm pineapple bun is a think to behold and having eaten it before, I cannot settle for anything less. This, unfortunately, was less. 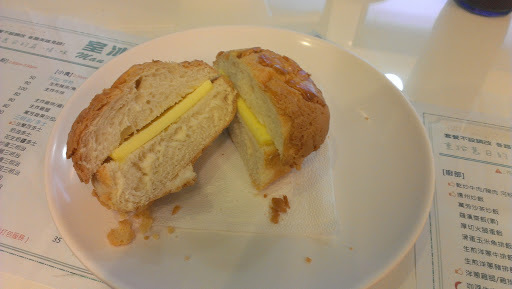 The taste was fine and a solid contender for pineapple buns all over, but please please please warm it next time! All in all, this restaurant is pretty good. 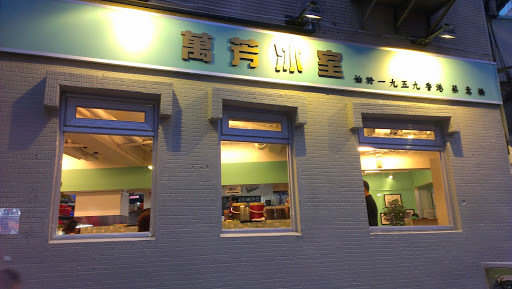 However, if I am looking to order Hong Kong style food then I prefer to go here: YanJi Hong Kong tea restaurant . However, that is not to say that if you are in the area then avoid this place, totally not. 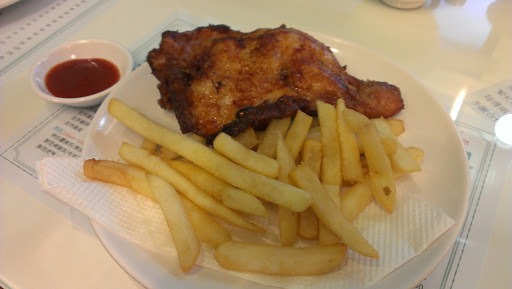 The fried chicken is pretty decent, just not worth going out of the way for. Best dish: 2. 乾炒牛肉河粉 gān chǎo niú ròu hé fěn Dry fried flat noodles with beef – tasty, different, good textures and overall a well-rounded dish. Dish I wouldn’t order again: 3. 冰火菠蘿包 bīng huǒ bō luó bāo Hong Kong special pineapple bread with butter – they just need to heat it up so that butter melts a little, please.